Jenna was born and raised in the Washington, DC metropolitan area. She was blessed with two artistically-inclined parents who didn't mind carting her hither and yon to various after-school theater programs, and even, on one memorable occasion, through a blizzard so she could perform in a children's show at the Kennedy Center. Jenna made her Shakespeare debut as Titania in Mrs. Rowland's 4th grade class' A Midsummer Night's Dream (probably the definitive version). Jenna left the DMV to get her BA in English and Drama at Mr. Jefferson's University (that's the University of Virginia to the unbrainwashed). While at UVa, she performed with First Year Players, which claims both Tina Fey and Sasheer Zamata as alumni. She also performed on the Drama Department's mainstage and black box, as well as with the Heritage Theater summer stock company. Then Jenna picked up sticks and moved to London to train at the London Academy of Music and Dramatic Art for three wonderful years, followed by two fantastic years working as a professional actor in one of the world's best theater cities. Highlights included a limited run at Theatre 503, one of London's most respected fringe venues, and a tour of a critically acclaimed production of The Laramie Project to Dublin. 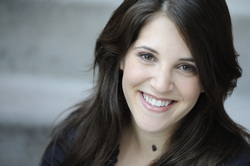 In 2011, Jenna moved back to Washington, DC and threw herself into the thriving DC theater scene. And baseball. Lots of baseball. Let's go Nats!